People who know me well, know me as ‘last minute Lily’, always on the last ‘push’. I was the same when it came to homework being submitted; on the day it was due, there I’d be manically scribbling away sweating over my Sugar Puffs… anyway I digress. After returning from my holiday in early September I was conscious about the interview I was doing the first day back in the office. I had every intention of preparing my questions whilst holidaying, however all best laid plans etc. So on the morning at the allocated time I tentatively rang star of ‘Keeping Up Appearances’ and ‘Last of the Summer Wine’, the lovely Josephine Tewson, about her one woman show she is currently on tour with. Imagine my surprise when she picked up the phone and exclaimed: “Is it Monday today? I thought it was tomorrow. I’ve got it down for tomorrow.” Gulp! For the first time in my life I was early for something…. Luckily for me Josephine went ahead with the interview. The furthest up North Josephine has travelled is Morecambe, where she spent a happy 18 months at the Royalty Theatre. “Some of my best anecdotes come from there, so I’m sure the people will enjoy it, there’s some very funny stuff in there. How did you meet Leonard, I ask “We met when we were both at Salisbury Rep, when we were both in ‘Free as Air’ but I’m not telling you anymore; because I’ll end up giving away the whole show…” she laughs. I was curious to learn how Josephine felt how stage and screen compared. “I’m so very old” she says. “When I started there wasn’t much TV work about anyway, so you’d go to RADA and then join repertory company, with the hope of being spotted by an agent. On a more sombre note, her voice drops when I mention the recent sudden death of her ‘Keeping Up Appearances’ co-star Geoffrey Hughes. “It’s terrible. Geoffrey went to live in the Isle of Wight which cut him off from any form of socialising with the rest of the cast. 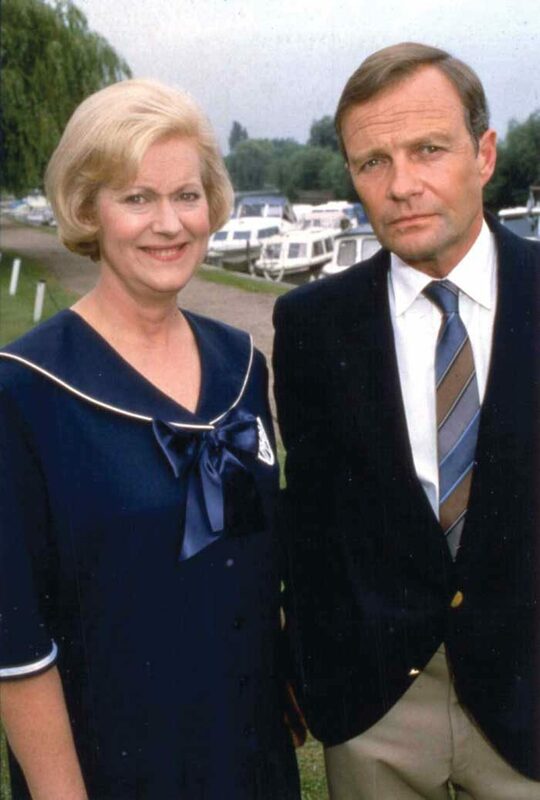 Her role as the rather nervy and unstable Elizabeth in the hit TV comedy ‘Keeping Up Appearances’ used to have me in stitches on a Sunday afternoon and I was saddened when I heard the show was finishing. Why did the show end? After her time on ‘Keeping Up Appearances’ in 2003 Josephine joined the cast of ‘The Last of the Summer Wine’ to play the part of Miss Davenport, a role she held for seven years until its shock cancellation. “For them it was a way of life. It was a terrible shock to them all. I remember when I first joined, I was filming a scene where I was painting on the moors and the moor sloped down to a lake. There were people walking about on my side of the moor, but on the other side there was nobody, I thought this was rather odd, until someone told me that the moor was Saddleworth…” Her voice trails off. Rumour has it that the actor John Inman was her cousin. “Oh my goodness,” she exclaims, “is that on the internet?” she asks. Josephine has ‘clocked up’ over 50 years acting, she was considering going to Durham University to study English, however her teacher, Mr Chapman told her dad that she should be an actress. It never crossed her mind that you could earn money by doing something she enjoyed, so she joined RADA (Royal Academy of Dramatic Art). When she began, 90% of Equity members were unemployed and the industry is still as tough today. “I wouldn’t advise anyone to be an actor. You’re not going to put anyone off who really wants to do it, you’re really not. However, if they are happy having a nine to five job there are plenty of wonderful amateur companies. You can get all the satisfaction of playing and get your enjoyment that way. “In a way I regretted that decision and wish I had gone to University, a University education offers you something you can’t get any other way. “I was terribly shy as a child – most actors are – and when we get behind a character, the shyness goes. Someone who was also very shy was Ronnie Barker. He was terribly shy; he would never talk about himself. “When he and Ronnie Corbett would chat and talk to the audience, Ronnie Corbett was a natural. However, Ronnie Barker hated every minute of it because he was being himself and not playing a character. After talking with Josephine, I don’t detect any nervousness, and with her latest show she won’t be hiding behind a character, what you see is what you’ll get, a warm, engaging and funny lady ready to entertain. Previous articleWhat do zombies and Emmerdale have in common?